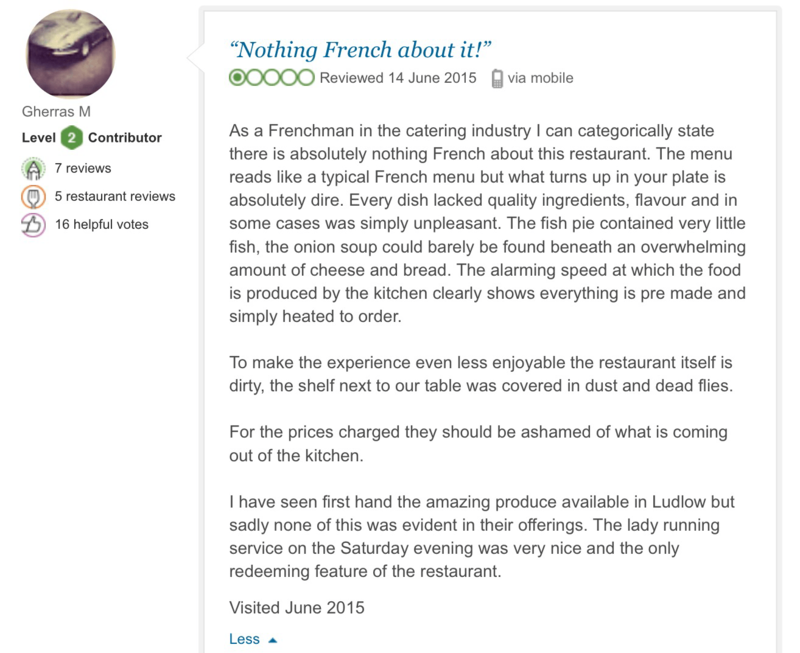 How should restaurateurs and hoteliers respond to negative reviews on TripAdvisor? It’s a question I’ve pondered many times as a social media trainer who, because of the job, eats out more than in and the answer is always the same: only after careful consideration. Doesn’t matter if we cook for a living or not, our instinct, when attacked, is to lash out. Attack being the best form of defence, or so the saying would have us believe. But it rarely is, whether we’re being bashed over the head with a real stick or it’s our online reputation that’s taking a digital beating. Why? Because in the heat of the moment we might end up doing, saying or writing something that makes matters worse. So here’s my recipe (forgive the pun) for avoiding disaster on TripAdvisor, or elsewhere on the social web for that matter. and 1 litre of bile. Mix all the ingredients together. Bring to the bile – I mean boil. Simmer, stew, roast… it really doesn’t matter which. The most important part is to serve the dish as publicly as possible. Most people use TripAdvisor for this purpose. Others swear by Facebook or Twitter. The really rancorous often serve up a slice on each. So how best to respond to something like this? Before I share with you what the owner of the restaurant castigated above actually said, here’s the decision-making process I encourage those in the hospitality business to follow. Have they got a point? And can you do something about it? If the answer to both is yes then thank them for bringing the matter to your attention and tell them (and the wider world) you’ve done something about it. If they’ve got a point but you can’t do anything to rectify the situation then gently explain why. Perhaps their complaint was about an argumentative couple at the table next to them. Not within your control, although you might point out that if they’d raised it at the time you’d have done your best to move them to a quieter table. In both cases saying sorry doesn’t hurt and plays well with the increasing number of would-be customers who use TripAdvisor to help them make their minds up where to stay or eat. (By the way, nobody’s really sure exactly how many people rely on TripAdvisor and you’d want to take the network’s own figures with a pinch of salt for obvious reasons but that the number is increasing is certainly the case). If you genuinely believe your critics haven’t got a point you’ve got three choices: ignore them (the least said soonest mended approach); thank them for their comments and leave it at that (the turn the other cheek method); or tell them they’re wrong and explain why (the customer isn’t always right technique). I’ve nothing against any of these approaches providing – and it’s an important proviso – in doing so you don’t compound the situation by inadvertently drawing more attention to it than is warranted. It’s also worth considering the gearing between positive and negative comments on the TripAdvisor visitor rating bar chart (see below). I don’t know about you, but I tend not to believe establishments that have nothing other than positive comments and avoid them. What I’m looking for is a nice smooth downward curve from top right to bottom left. Lots of excellents and very goods, some averages, a few poors and even fewer terribles. Generally speaking the higher the number of reviews of any kind the more accurate the reflection of the establishment. That’s the beauty of crowd sourcing. One or two people might be mischievous, malicious or just plain wrong. But hundreds? Unlikely. It’s a warning sign. And not only for potential customers but also for the management. A warning they ignore at their peril. There is an alternative method. I call it the Basil Fawlty way. Done well it’s hugely entertaining and actually makes you want to visit the place being so rigorously defended. Done badly it can leave a poor taste. Just like food. And there’s the rub. Taste is such a subjective thing. One man’s meat is another man’s poison and all that. 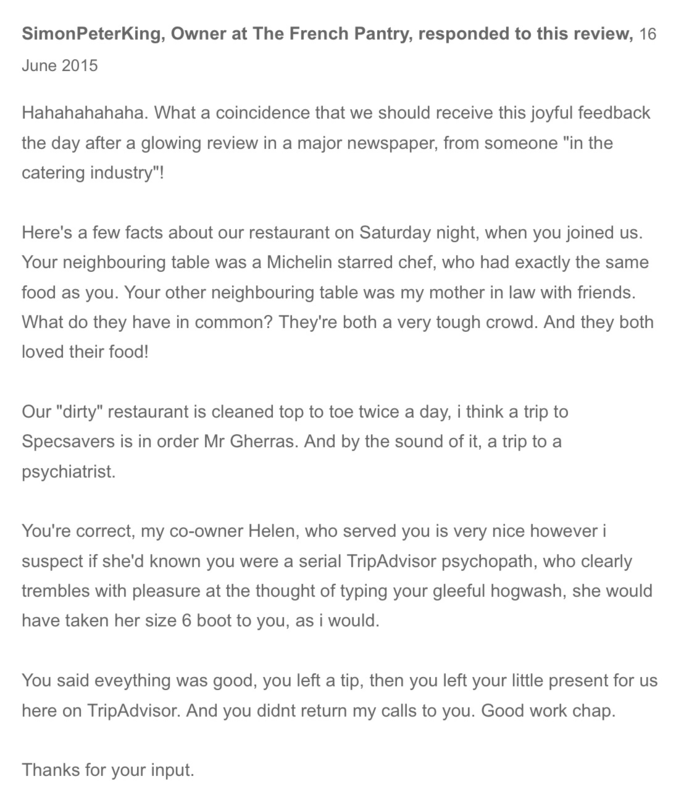 Perhaps we should be thankful that the range of replies on TripAdvisor is as wide as the range of food on offer. Something for everyone. Here’s the French Pantry’s response to the complaint above. For the record I’ve eaten there many times and always enjoyed it. I like the owners Simon and Helen. Simon’s a colourful character. An accomplished musician as well as a restaurateur. Whether he’s too colourful at times with his use of language…well I’ll let you be the judge. Comments, as always, welcome. Even negatives ones! A Fawlty-esque defence. Right or wrong?